High Food Prices: Do family farmers benefit? Farm prices are up again, so farmers must be getting rich, right? The U.S. Department of Agriculture sure thinks so, projecting that U.S. farmers will see record net cash farm income of $99 billion in 2011. The media follows the government’s lead, offering interviews with farmers gushing about their new-found prosperity. Are things really so great down on the U.S. farm? They may be for the big guys, but they’re not for many family farmers. My recent study, “Still Waiting for the Farm Boom: Family Farmers Worse Off Despite High Prices,” shows that the largest farms were capturing a remarkable 88% of all net cash farm income. Meanwhile, small-to-mid-scale family farmers had lower farm incomes in 2009 than they did earlier in the decade when prices were lower, and their household incomes were down as well thanks to the Great Recession. The data reveal a lot about the precarious nature of family farming, even in a resource-rich country like the United States. As Table 1 shows, the average farmer in this group has not fared much better since agricultural commodity prices began rising in late 2006. 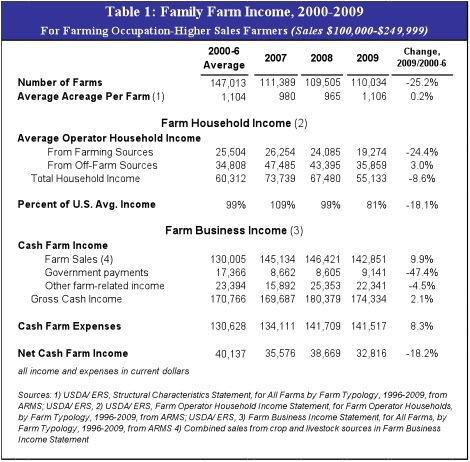 The table presents both farm household income and farm business income for “Farming Occupation-Higher Sales” farms. These are what most people imagine when they think of U.S. family farmers: family-run operations relying on their own labor. Data come from a readily available USDA survey. These are not small farms: average size is 1,100 acres and gross sales are $100,000-$250,000. But as the table shows, their margins are incredibly small and they live mainly from off-farm income, usually from one or more family members working in town. The top part of the table, on household income, shows just how misleading the prevailing image of the wealthy farmer is. In 2009, the average farm household in this group earned just $19,274 from farming, including government payments. This is down more than 20% from the high-price years of 2007-8, but it is also lower than the average farming income during the relatively low-price years of 2000-6. Income from off-farm sources, most often paid work by one or more family members, provided nearly twice as much support as farm-related income in all three recent years. But the recession reduced off-farm income in 2009 by 24% from its 2007 level. This left average household income for these farm families at just $55,133, down 24% from the 2000-6 average even before adjusting for inflation. That leaves them at just 81% of average household income for the United States as a whole. The second part of Table 1 looks at farm businesses (as opposed to households) for this same sales class. 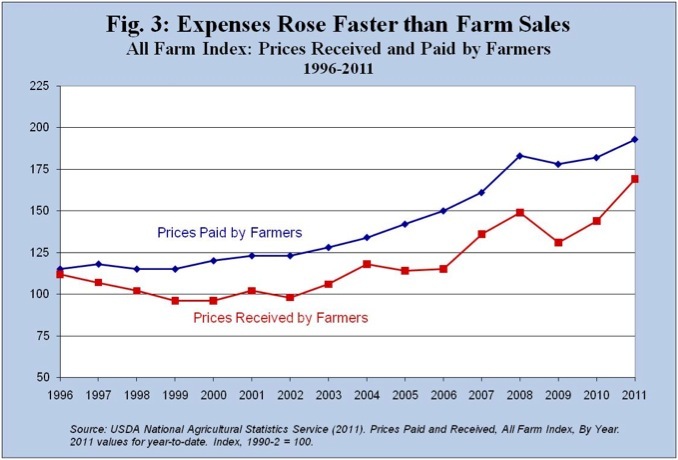 It shows that income from farm sales indeed went up with the higher prices from 2007-9. In 2009, farm sales were up about 10% over their 2000-6 average, even after falling from 2007 and 2008 levels. But that gain of about $13,000 was offset by a drop of about $8,000 in government payments compared to the 2000-6 period, a result of higher prices eliminating or reducing payments under the government programs tied to price. The remaining small gains were obliterated by higher costs, as prices for fertilizers, chemicals, seeds, feed, fuel, and other inputs followed the same upward curve as crop prices. Expenses in 2009 were nearly $11,000 higher than they were in the 2000-6 period. As Figure 3 from my study shows, the prices paid by farmers since 1996 have increased faster than the prices they received. And a recent study documents that credit has grown harder to secure as well. The bottom line? Even without adjusting for inflation, net cash farm income was lower in all three higher-price years (2007-9) than it was in 2000-6 for this class of family farms. In 2009 it was down by about $7,000, or 19%. At $32,816, that is just $30/acre, or $75/hectare. This is not surprising to farmers, but it is news to anyone who has been listening to “farm boom” reports coming through the media. USDA data shows that even before the run-up in crop prices, the prices for farm inputs had been rising faster than crop prices (see Fig. 3). Farmers are being squeezed, between the suppliers, which often exercise market power in the seed, equipment, and chemical industries, and their buyers, which are often large conglomerates – Cargill, Archer Daniels Midland, etc. – who are themselves often selling to large conglomerates – Smithfield, Tyson, etc. – who are selling to the giant retailers – with Walmart at the top of this unhealthy food chain. Only the largest farms can make good money on such small margins, and that is what the data show. 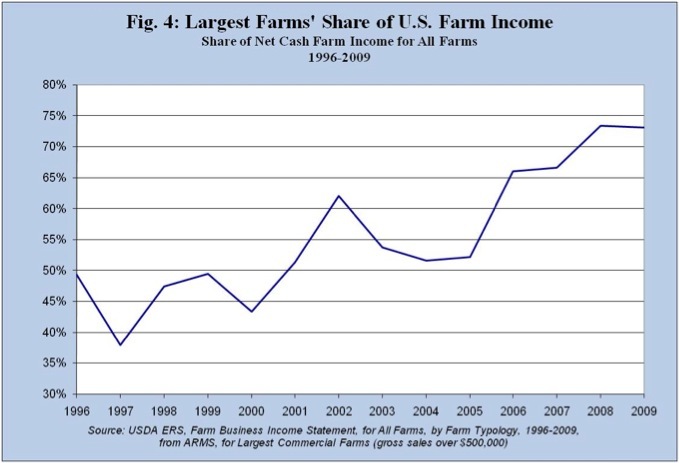 This last graph shows how the largest farms’ share of farm income has risen in the last fifteen years, from under 50% to over 70%. Add to these the small share of U.S. farms operated as corporations or other non-family operations and the share in 2009 reached 88%. So much for a boom for family farmers in the United States. For more on this, read “Still Waiting for the Farm Boom,” and see Wise’s ongoing work on Myths About U.S. Farm Income. One problem is that large farms don’t have to obey the laws of the land or the realities of either traditional or modern economics. Traditional econ? All costs are covered. Modern econ? Someone says, “Hey, wait a minute.” When under employed rural populations that can produce twice the yield of corporate farms per acre are shunted to over crowded urban slums in favor of expensive capital inputs that produce more per hour of labor. Got it? Efficiency in the old econ chooses yield per hour using scarce capital over efficiency of land yield using plentiful labor. Why? Corporatism is about centralization of wealth and power rather than optimization of health and well being. Robert Kennedy Jr. explains it this way: Pig farms in Iowa create as much sewage as New York City, which has fourteen sewage plants at a cost of one billion each. If pig business in Iowa had to follow the same laws of sanitary decency as people, the cost of their pork would be $75/lb. Many smaller scale family farms that can use the sewage on the land would fit in to this picture at a lot less than $75/lb, and this doesn’t even begin to look at the cost of pollution, or loss of anti-biotic medicines to overuse, or prisons for people squeezed from the land, or …..
Hi Tim. I read this report with interest, but see the data a bit differently. I’ll put the details at the U.S. Food Policy blog. Is it possible that you misinterpreted the average acreage in the data you tabulated? You say of the farms in your data, “these are not small farms.” But most mid-sized to large family farms, and especially most family-operated crop farms with 800-1,000 acres or more, are doing quite well when prices are high. I imagine that on reflection you would agree that farms on this scale were not the intended subject of your concern. Thanks to Parke for digging deeper into the USDA data and presenting how other sectors of the family farm community are doing with higher prices.His post on US Food Policy Blog is worth reading. In my policy brief, I intentionally used the term “small to mid-scale family farms” as a way to distinguish them precisely from the larger farms Parke highlights. These are not what USDA in its ARMS survey call “small family farms.” Those are really too small to be viable, as noted in the report. But I’d defend the reference to the $100,000-250,000 sales class of farmers as “small to mid-scale.” Parke is right that the category includes some ranchers who skew upwards the average acreage for the group, but more than half are grain farmers of one kind or another. A closer look at the different crop specialties shows the variety of experiences among different types of farmers. Not surprisingly, crop farmers do better than livestock farmers, something I note in the policy brief. The same is true among the large farms. But the real point of the policy brief was to show that not all farmers are actually better off economically under the high-price scenario, because expenses are up dramatically (continuing a long trend in which expenses have risen faster than farm sales) and because farm payments decline with lower prices. These are full-time, commercially viable farms, and it remains striking that a large number of them see so little benefit even when crop prices are high. Parke is right to point out that these farms do not represent all family farms, and some are certainly doing better, and some are actually doing quite well. That said, it would certainly be a shame to dismiss these farmers as just too small to be viable, following the “get big or get out” trends in US agriculture. I would like to see US agricultural policies that help sustain this sector of our farming communities.